Service Archives - Jack A Stark, Ph.D.
During a rough patch a few months ago, his old psychologist, Jack Stark, visited McDermott in Chicago. 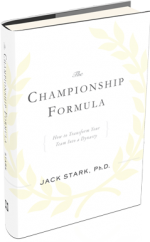 Jack Stark helps NASCAR drivers and pit crews stay focused on winning. The Court of Honor, established in 1988, is one of the Foundation’s most prestigious awards. The recognition is given annually to individuals who have excelled in one of the following categories: Agriculture, Arts, Business and Industry, Community Service, Education, Philanthropy, Professions, Public Service, Sports or Youth. As a performance psychologist, Jack Stark provides psychological and performance enhancement training to elite athletes at the collegiate, professional and Olympic levels. He served as the team psychologist (1989-2004) for the University of Nebraska Cornhusker football program. Copyright © 2018 Jack A. Stark. All rights reserved.